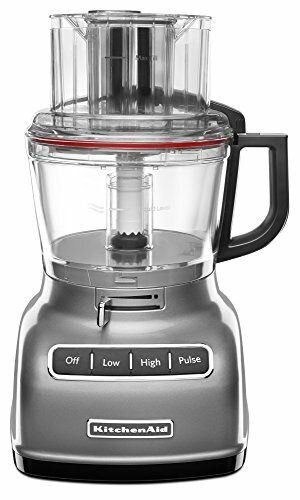 Kitchenaid 9-cup food processor external adjustable slicing lever, optimized speeds with low, high and pulse and 3-in-1 wide feed tube. The 3-in-1 Wide Mouth Feed Tube lets you accommodate large items-like tomatoes, cucumbers and potatoes with very little prep beforehand. Model KFP0933 includes 9-Cup Work Bowl, 3-Cup Work Bowl, Adjustable Slicing Disc, Reversible Shredding Disc, Multipurpose Blade, Multipurpose Blade for 3-Cup Work Bowl, Dough Blade.